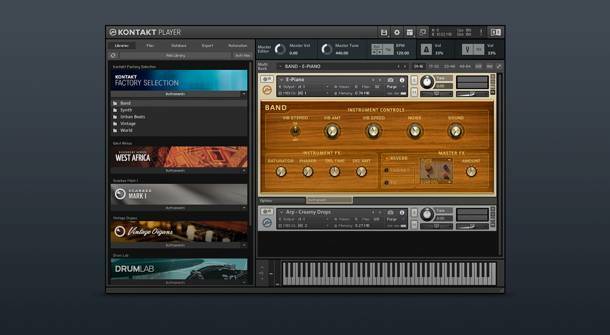 In my latest YouTube video I am taking a quick look at Native Instrument’s Kontakt Player. This is a free product that comes with a respectable amount of instruments. It is ideal for anyone getting started with sampling or interested in getting into music technology. I made the video for some of my piano students who have expressed an interest. The video does show the full version of Kontakt, but the player version is essentially the same. The only major difference is you can’t created your own instruments from samples or edit the existing instruments and a few other restrictions. Please leave comments here and let me know what future tutorial videos you’d like to see. Listen to my contribution to a collaborative effort with Spitfire Audio. (Alas it wasn’t selected as part of the song). A solo organ arrangement of Beneath The Cross Of Jesus. I have some instrumental ensemble (orchestra) titles coming soon. If you have any suggestions for what type of music you’d like to see me add to the catalog, please comment below. Continuing with my series of liner notes for my album Sampler, we get to track number 8. This is a darker sounding track. It consists of 6 instruments and various effects. First up is the Bass, the Padaboom patch from the Substance library by Output. Next is the Arp Harp Loop patch from Output’s Signal Pulse library. I believe the patch may be part of an add-on library. Next is the After Waves patch from Output’s Exhale program. The patch is probably part of an add-on library. It looks like most of this piece uses Output’s various libraries. The next track is Tears in Rain patch from Analog strings by Output. The next patch is a PolyBrass 2 from Kontakt’s RetroMachines Mk2. I believe this is an emulation of a Korg PolySix patch. The PolySix was the first synthesizer I ever owned. Finally we have Battery 4 using the Sad Flamingo Kit. For all the instruments, I only used automation on the Battery kit and that was for some volume changes. I must have been happy with the sounds of the instruments because I used practically no effects on anything. Only the drums (Battery 4) were processed. I sent them (-13db) to a rever bus. The reverb was the Native Instruments/Softube emulation of the RC48 using a Medium Hall preset. I sent the reverb (0db) to a Gate buss. On the master bus I cut out frequencies below 30hz and used the Lurseen Mastering Console from IK-Multimedia. I used the Classical (More Glue) preset. If I made any changes, it would have been to the De-esser or compressor in the chain view options (icon at top). This plugin makes a huge difference in the final sound. It isn’t just louder, but better sounding. The first track is called Beginning The Adventure. As a side note, I have to say that coming up with titles for my music is probably one of the most difficult aspects of composing I have. I always start with the music first and since there are no lyrics in my music, it makes sense. The last thing I do is come up with titles. Since I needed something a bit upbeat to set the mood, this track seemed appropriate, although I did give consideration to the “trance” like track “Exciting times,” but I thought “Beginning The Adventure” was a better choice. I probably should have included Heavyocity in the name of this song. As best as I can tell, I only used Heavyocity products on this recording. I’m not big on using hundreds or even dozens of tracks to make a piece of music. The Heavyocity material frequently has 3 channels of sounds in one preset and offers a wide choice of effects all within the software avoiding the need to do a great deal of processing in my DAW. So, I only ended up with 7 tracks. I use “Reaper” as my DAW of choice. All of the original 7 tracks were MIDI tracks. I “freezed” the tracks once I had the sound I wanted. “Freezed” (or should it be “froze”?) is the term Reaper uses, in this case, to turn a MIDI track into an audio track. It renders the midi instrument into an audio file. It’s like in the old days of recording, committing to tape the take you best liked of live performers. The nice things is that in Reaper it is very easy to “un-freeze” (no they don’t call it “thaw”) the track if you don’t like it. (You do loose the edits you’ve made to the audio file, if any, but that’s kinda the point in “un-freezing” it). Since there were so many processing and sound sculpting options in the software instruments – and I did process the default patches – I did very little processing in Reaper. In fact I only used two effects prior to the stereo bus. One was the Native Instrument/Soft Tube emulation of the Lexicon RC48 reverb. I modified the Grainy Echoes preset using a Random Hall and setting it on effect rather than reverb. Since this was on its own bus it was 100% wet. I used the send amounts to balance how much reverb each of the 7 tracks got. You may hear other reverb sounds but those come from the individual instruments themselves. I then routed the reverb to both the stereo bus (0 db) and to a delay bus (at -23db). I used the built-in ReaDelay that comes with reaper. I modified the basic ‘5-tap ping pong’ delay. Each tap was 1/4 of an eighth note after the other, panning left/right and getting softer. That went straight to the stereo bus. In Reaper there is always a “master mix” channel. (See photo above). Other than a hard limiter (to prevent accidental or hidden clipping) I don’t put anything on it. Instead I setup a folder, the parent folder being the final stereo mix. The 7 music channels and 2 effect bus channels feed into it. Since I was having to master my own material, I put an EQ on this channel with a high-pass filter removing unneeded low end. I then added the IK-Multimedia mastering plugin “Lurssen Mastering Console.” I started with the EDM preset and modified to get the sound I was after. For this album I opted to mix everything using the TR5 Metering plugin from IK Multimedia for an average mix of -16 LUFS (which is the level at which many online streaming services prefer tracks to be and is a broadcast industry standard). And that’s the details on that piece. It’s been nearly 3 years since I released an album so I thought it was about time to release a new one. This one is a sampler of various styles of music I compose, arrange or record. Some of it is available in sheet music from my website. Look for it June 1, 2018 on CD-Baby, iTunes, Google Play, Amazon MP3, YouTube Music, Spotify and more. I plan to post some details in the upcoming weeks about various tracks. In the meanwhile, an audio sample and part of the description on my CD Baby page is below. Please consider buying a copy of the whole album or individual tracks or stream it on Spotify. Many of the titles are available in sheet music form at his website. Those that aren’t rely too much on specific computer sound libraries to be played by acoustic instruments. Three titles are based on brass quintet arrangements, but of course added to for the recording. One piece is based entirely on the results of fractal math formulas. Another one, the all percussion piece, Very Confused, uses a Beethoven piano sonata as the source rhythm but then highly manipulated. Another piece is based on a 12-tone instrumental ensemble piece. Yet another piece is more like modern trance music, but with James’ own twist. A couple came about as a result of experimenting with various sound libraries. Waiting and watching found its origins from music written on an iPad using NotateMe while in a doctor’s waiting room! While every title might not be for everybody, there is something here that you will like. Did they even listen to my entry? So, a few posts ago I mentioned that Spitfire Audio was having a contest that I had entered. The one and half minute video was provided by them. Contestants had to write music to fit the video. It didn’t matter what sound libraries we used, it was “the composition that mattered.” Given the winning entry, which isn’t a bad musical competition, I wonder if my entry made it to them? The composition is little more than a 1:15 tension builder. It doesn’t resolve the tension. When I’m looking to buy a sound library, this music doesn’t do it for me. The music doesn’t fit the video. It in no way enhances or supports the visuals we see. (Some comments on their facebook page agree with me here). It is so repetitive to the point of almost being boring. When it switches from graphics to the control room, why no change to draw the viewer, who may have turned away while watching on their phone, tablet or PC, to the change? When we see a large horn section, I have trouble hearing any horns. The only thing in the video are horns yet there are no obvious horns in the music. The same thing when we see flutes, trumpets and a timpani player feverlishly bangs on the timpani, we don’t hear flutes, trumpets or timpani. Why not? It would be an excellent way to showcase the product and its multiple capabilities instead of hearing essentially the same thing we’ve heard from the beginning. When the woman is showed at her computer using Albion, why not give us something electronic? Movie soundtracks aren’t all symphonic orchestra are they? The biggest thing that bothers me is when she plays a C on her keyboard (after seeing that she has a string sound loaded up) we don’t hear a C, not even a note in the C chord, nor are strings featured. What happened to matching the music to enhance the visuals? Any how, here is my entry. I know it isn’t perfect. The mixing and mastering need some work and it probably would have helped to layer in some more sounds to what is there. I would really like some comments as to why my attempt was not as good as the winner.